Get the perfect sonic experience with the Sony Store Speakers SA-D10 (Black). The speaker set is packed to the hilt with unique and exciting features which ensures best-in-class sonic output with exquisite convenience and control. 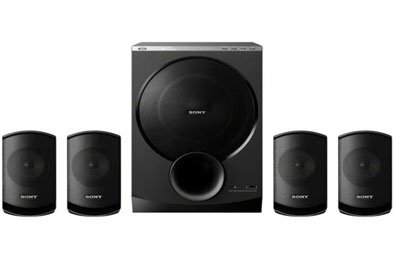 The Sony Speakers SA-D10 (Black) is a Sony Store 4.1 Channel Speaker system which ensures superior sound from all angles. It features a Passive Speaker system for superior fidelity. The system has a Bass Reflex Enclosure with an extra-large wooden subwoofer which enhances bass frequencies for an engaging sound output. The Digital Amplifier ensures proper power to drive the speakers, reproducing life-like and accurate sounds. It features a Fixed/Punched Metal Grille, providing protection to the speaker drivers as well as adding elegance to the set. The Sony Speakers SA-D10 (Black) has a rated Frequency Response Range of 40Hz to 20KHz. It ensures thumping bass lines, clear mid tones and sharp treble sounds. The speaker set has a total output of 70W. The speaker set features connectivity options galore! It features USB playability, allowing you to easily connect a plethora of USB compatible devices and play music through them. It also comes with a remote control, for intuitive control from a distance. To ensure complete peace of mind, the unit comes with 1 Year Warranty. These Sony Store 4.1 speakers are compatible with multiple digital devices. You can simply connect the two through the USB port and enjoy your favourite music. Additionally, you can also watch your favourite movies by connecting your laptop and tablet through the USB port on these Sony multimedia speakers. You can control this device from the comfort of your couch with its fully functional remote control. Play, pause or switch to the next track easily with the remote’s easy-touch buttons. It also has a digital amplifier that balances the audio to produce smooth sounds.